Big Agnes Tufly SL2+ Tent. A shelter for any adventurer who wants the best of the best in features, material, and construction, the Tufly SL2+ has been expertly designed by the women of Big Agnes - a seasoned bunch of backpackers, skiers, mountain bikers and adventurers. 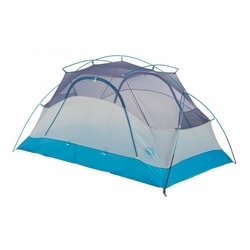 Steep side wall architecture, two doors/two vestibules, easy pitch, and an oversized 2 person size are just a few of the bomber features of this superlight tent. Project Tufly Defined: Several years back Big Agnes asked staff members from various department to collaborate on a future backpacking tent. The idea was to capture the features, architecture, storage and creature comforts that they most wanted in a tent. After a few attempts we unveil the Tufly SL2+ as their final offering. The fact that this group was made up a women from the staff makes the story even cooler. With decades of combined experience skiing, rafting, mountain biking and adventuring under their belts, the weren't creating a 'women's tent', but designing a shelter for any adventurer who wants the best of the best in features, materials and construction.